Guests can purchase wine on the spot and enjoy it in the Tuscan-inspired olive grove complete with picnic tables and shade umbrellas. Watch the event calendar as local wine makers and vintners show off their latest blends and host wine-themed events here throughout the year. At this charming neighborhood stomp, their whole purpose is to make wine approachable and take the guesswork out of selecting the right wine. 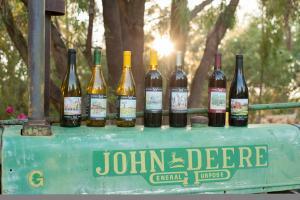 Locals continually recognize them as offering one of the best wine selections in the Valley. 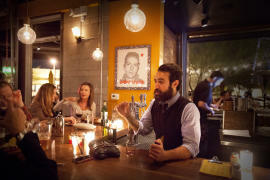 This hidden underground gem features weekly wine and beer tastings, and a newly-renovated lounge. Local wineries showcase their latest blends here and you can easily go home with several bottles from Pillsbury Wine Company, Caduceus Cellars, Arizona Stronghold Vineyards and Page Springs Cellars to name a few. Located just east of Mesa in neighboring Florence, Arizona this quaint countryside farmstead turned winery is a great day trip for any Greater Phoenix visitor. The tasting room, located inside of a beautifully refurbished dairy barn, is open Wednesday through Saturday. Call ahead for exact times and special tasting events. Located inside Barnone, Arizona’s newest Craftsman Community located inside a repurposed and re-engineered Quonset hut. Arizona winemakers Todd and Kelly Bostock and their friends Brian and Kelly Ruffentine are introducing guests to small batch, creative Arizona wines at their micro-winery Garage East. 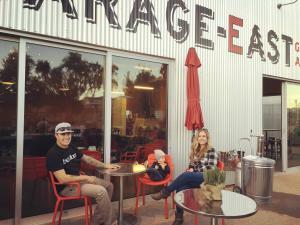 All wines are exclusive to Garage-East, meaning they need to be tasted and enjoyed when visiting Arizona and can only be purchased in person to take home. 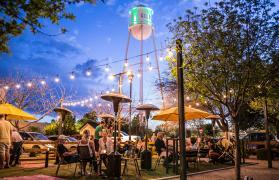 Il Vinaio, which means the wine merchant, is a neighborhood american restaurant and beer & wine bar, serving downtown Mesa. Their unique "wine bottle shaped” Bar is open for wine and beer tastings and live entertainment. It&apos;s the perfect destination for date night, small parties, or even a night out with the family!